I often hand embroider using chenille thread. 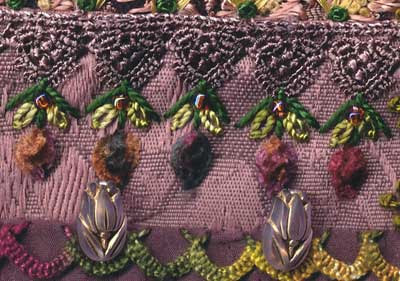 For instance on this crazy quilt block, the buds in this seam embellishment are oyster stitch worked in chenille thread. I frequently get asked how I do it and after a comment left this morning I decided to write up some tips. Firstly I look at the weave of the fabric. If the fabric weave is too tight ie too many threads to the inch you will have problems and the chenille thread will shred. The fabric that the sample is on is a furnishing fabric so it is thick but the weave is loose. Synthetic fabrics will often shred the thread too so I go for natural fabrics. Linen is ideal as it has a lot of natural give in it. I use a chenille needle. This is a needle with a large eye like a tapestry needle but it has a sharp point to pierce the fabric. I have found that often genuine cotton chenille will work better than the synthetic chenille threads. I found this out by accident as I purchased some from a weaving yarn supplier to hand dye, and discovered it stitched up like a dream. Hand embroidery is always about the relationship between fabric, thread and needle and what will work with one fabric will not work with another. This is why I always encourage people to try different foundations, different threads, and different needles. The combinations are endless and so are the discoveries! This is really helpful, I was disappointed that the silk chenille shed so much – I was wondering how to use it. Tried some cotton chenille and it worked a treat. This is the problem for me, knowing which threads and fabrics to try – I get overwhelmed by the choices. Sharon, can you suggest a source for chenille thread? I’ve been commissioned to repair and further embellish an antique CQ. There’s some chenille embroidery on it and I’m thinking it might be good work a bit more into the quilt. Thank you Sharon for this great tip. I have chenille and apart for dragonfly and other insect bodies, I usually couch it only. I will try this out today. Your plump buds look great. Thanks, Sharon. I’m encouraged to try again with my Stef Francis cotton chenille.